Wash drawing by Murugesa Moodaliar of fragments of a drum frieze panel and of a drum slab from the Great Stupa of Amaravati. This is one of 42 sheets (89 drawings) depicting sculpture from Amaravati and S. India. Inscribed with numbers 2 to 90 (1 is missing) and with measurements; signed:' P. Mooroogasa Moodr', dated c.1853. The drawing No.75 depicts a fragment of a drum frieze carved with a railing pattern and narrative scenes, the one in the centre depicting the Great Departure of the Buddha with horse Kanthaka. The relief is assigned to the 2nd century AD. 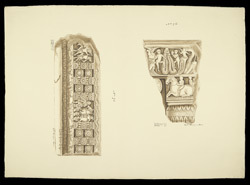 The drawing No.76 depicts a small fragment of a sculptured panel showing a pillar capital of the cushion type crowned with a horse-and-rider and a trio of monkeys in the top border. this relief has been assigned to c.1st century BC.